In November 2002, we launched with games like MechAssault, NFL Fever and of course Ghost Recon and since then we’ve never stopped building the service as your center for always on, always connected gaming and entertainment. To celebrate, head over to Xbox.com for details on how you can win one of the VERY limited edition Tenth Anniversary consoles* and pick up your free copy of Wreckateer. Plus members can save 50% on Castle Crashers, Battlefeld 1943, Fruit Ninja Kinect, Geometry Wars: Retro Evolved, Bastion, Peggle and Full House Poker. 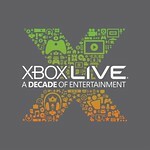 Don’t forget to download the free Gamer picture Your local Xbox.com may also have additional promotions for the anniversary, so be sure to sign in with your account and see what’s up and details. PLUS: Today only (Thursday, November 15th) I am giving away 10 free One year subscriptions to Xbox LIVE Gold every hour for 10 hours. Starting at 11a ET/8a PT I’ll be looking at Twitter for @replies to @MajorNelson tagged with #XboxLIVEis10 where you tell me your favorite memory, game or experience you had on Xbox LIVE over the past 10-years. If you have room, throw in your Gamertag as well. Every hour from 10a ET/7a PT until 7p ET/4p PT I’ll be giving away 10 Xbox LIVE One-year Gold Subscriptions. Remember you must be following me so I can DM you a code if you are randomly chosen. The contest is open to my twitter followers in all Xbox LIVE regions. I am not doing the random giveaway at the same time every hour, I’ll be mixing it up a bit to make it interesting. You also don’t have to keep track if you won or not, if you are chosen, I’ll DM you a code. One entry per person please. To make it easy, you can Tweet (and enter) directly from the box below.